Q. Did they take away colored flags in Outlook 2010/2013? A. Yes and no. Follow-up flags are now gradated shades of red depending upon how soon the item is due. Multiple colors are now assigned to categories. You have up to 25 colors now to choose from. Right click on any item and choose Categorize. To set up new ones, choose All Categories…. Now, you get the time importance and reminder capabilities of Follow-up flags and the visual organizational capability of categories. Q. I used to be able to color email messages from certain people a particular color. This made them easier to spot in my inbox. Did they take that functionality away in Outlook 2010/2013? A. They didn’t take it away. However, they did rename it to Conditional Formatting. If it sounds familiar, that’s because it is a feature of Excel, too. It means the same thing in both applications. Format cell data based on its contents. For example, if a number is less than zero, show it in red. You’ll find the settings on the View tab, in the first group on the left. Click View Settings and the Conditional Formatting button. Once in the dialog box, click the Add button. 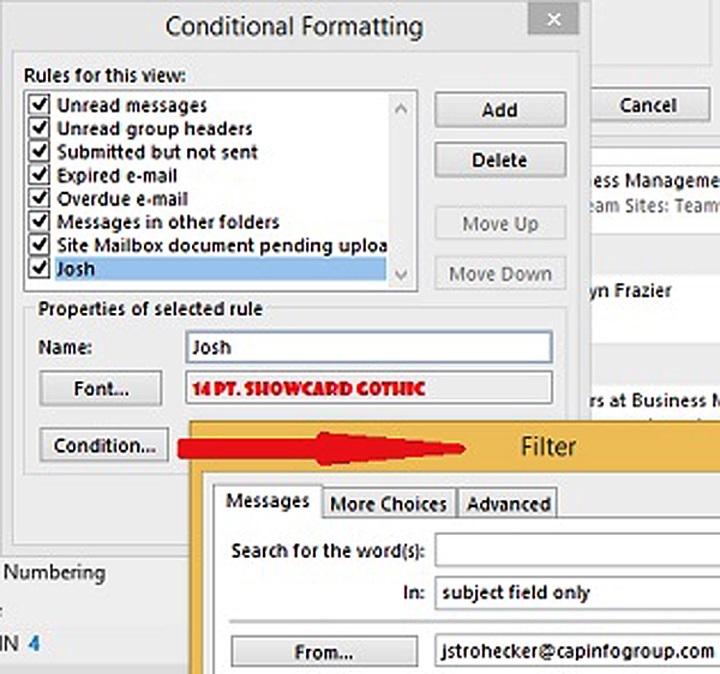 Name your rule, set the formatting and then (very important) set your conditions in the Filter dialog box by clicking the Conditions button. Q. Where did the To Do bar go in Outlook 2013? A. It’s still there! It may not show up by default anymore, but you can turn on one or more elements of it. On the View tab, in the Layout group, click the To-Do bar dropdown button. Select from Calendar, People and/or Tasks. The order in which you select them will be the order in which they appear. If you like the functionality of the To-Do bar, but not all the screen real estate it takes up, hover over Calendar, People or Tasks at the bottom left of the Outlook screen to get a look at the same information as you would see in the To-Do bar for each. When I upgrde from Outlook 2003 to 2010 will I loose all of my emails and my contacts?